Do you love beautiful images of textiles, flowers, jewellery or home decor? Do you need them to showcase your work on social media or just for inspiration? I do, but now I’m looking at images with different eyes. I’m thinking, how can I do something similar with what I have at home? Taking the time to style shots of my work, the tools I use or just things I love, using everyday items and objects – has become my new bff! It’s a great way to promote what I do in an interesting way, as well as show a little more of my personality. Magazines do it all the time because they know people love to see beautiful images, that show the personality of the maker or their surroundings. That’s what I’m going to do now. Let me show you. coloured threads, beautiful scissors, stunning beads – look for unusual shapes and textures. gorgeous fabrics, pretty wrapping paper, magazines and books – again look for different textures, shapes and colours. 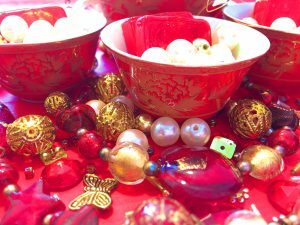 crockery (I love old china), candles, perfume bottles, shells – why not? 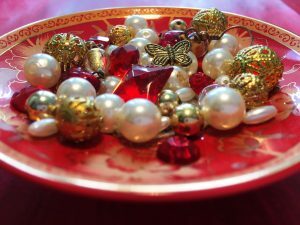 pretty jewellery, flowers – fake or real, placemats or coasters, chopsticks, cutlery and napkin rings, old perfume bottles. your hands! I think hands add such emotiveness and personality to a shot. Now you have the idea of thinking outside the square for props, there needs to be some sort of cohesiveness to make the shot look and feel harmonious. If you’re like me and work with textiles and stitch, you already have the knowledge and skill to do this. What am I looking for? Some sort of theme – something to tie the objects together. It may be to tell the story of the work being photographed, or the tools used to make it, or it may just be as simple as the colour. That’s always a great place to start for me! Also, try to have one, stand-out item. Something that really catches the eye or is totally different from everything else. 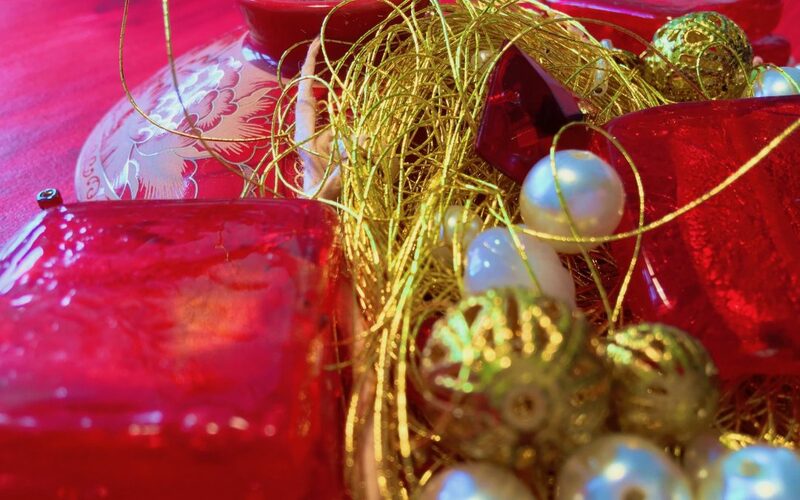 So with a theme of the colour red, I looked for different shapes and textures in objects I already had around my home, that would work together harmoniously. hand-painted paper from some long-finished collage, which I used to lay under the other props. a beautiful, dainty tea set I bought at the markets in Hong Kong. red flat beads from Spotlight. pearly beads of differing shapes and sizes. 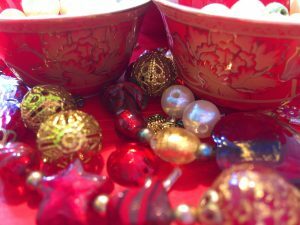 gold baubles, again from Spotlight. Murano glass earrings and necklace. These are my three favourite images, but I took a number more. Remember to change things around and take numerous shots while you have all your props out. So what other ways could these images be used? Apart from this post, I could use them on other social media platforms as well as make a slideshow or video. Once you start taking images of the things you love, the sky’s the limit. Plus these images are fantastic inspiration for new designs. Look at those lines and shapes. That’s design manna from heaven! So from me to you, use the beautiful, simple things you already have. Learn how to take great shots and how to edit them to your liking. And then share them, so we can all enjoy seeing original, creative work. Things are happening behind the scenes here. Slowly, slowly though. I’m really excited, so I hope you’ll enjoy both the new look and the new content, featuring a new name for clarity and cohesiveness as well as a page devoted to Resources. These will include Checklists, LookBooks, Reading Lists, Classes and Stitch in History – something I’m really interested in. It’s fascinating. If these kinds of things excite you too, please sign up and you’ll receive notifications directly to your inbox.